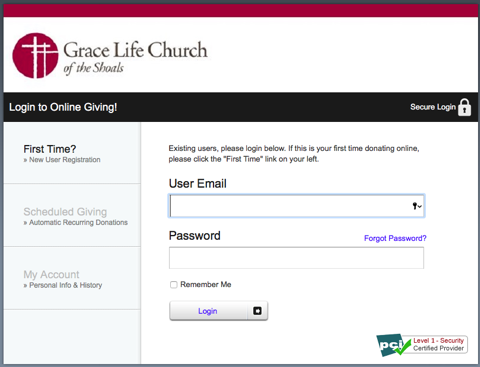 We have changed our online giving to ShelbyGiving. You will need to do a one-time account set up with them to continue or to begin giving online. Click "Give Here" above to get started. You will be taken to the ShelbyGiving website where all secure transactions will take place. There you will create an account. (See the screen shot below.) Then you may choose to give by eCheck to clear directly against your bank account or by debit or credit card. Please carefully select how you want to designate your giving (General Fund for tithes and offerings and Faith Commitment Fund for missions’ efforts). If you have any questions, please contact the Grace Life Finance Office at 256-248-0830.